After four years of drought, turfgrass has taken a beating. Some people have turned off the water—the turf has turned into a few patches of grass, but mostly weeds, if anything is growing at all (Figure 1.) Others have reduced irrigation amount or frequency resulting in sparse grass and more weeds (often perennial weeds and/or drought tolerant weeds such as bermudagrass, dallisgrass, field bindweed, dandelion, narrow or broadleaf plantain, knotweed, hairy fleabane, star thistle and others.) Other people of course have removed the grass and replaced the landscape without turfgrass. There also has been a concerted effort to get people to reduce the grass in the landscape by painting with a broad brush that grass is a heavy water user, without mentioning the beneficial effects of growing a grass in part of the landscape. Before we just remove everything and plant rocks (which are almost impossible to remove if you ever want to change the landscape), and chips with a few shrubs or groundcover, maybe we need to think of what we really want to do in our surroundings. Do we want a place to play with children, or a dog, in our landscape? Do we just want a static display to look at, with no other care than reducing water use? Another concern, not often thought about, is by removing turfgrass as a part of the landscape, we will contribute to a warmer environment around our home; turfgrass also has many other beneficial effects for the environment, besides cooling (Jim Baird, University of California Agricultural & Natural Resources (UC ANR) Cooperative Extension Specialist, based at UC Riverside, in UC ANR News 2015.) There are many environmental benefits of having turfgrass. Some of these include fixing carbon from CO2 from the air, removing other air contaminants, reducing dust, increasing water penetration into soil, reducing water runoff into drains and reducing runoff of contaminates from bare soil. 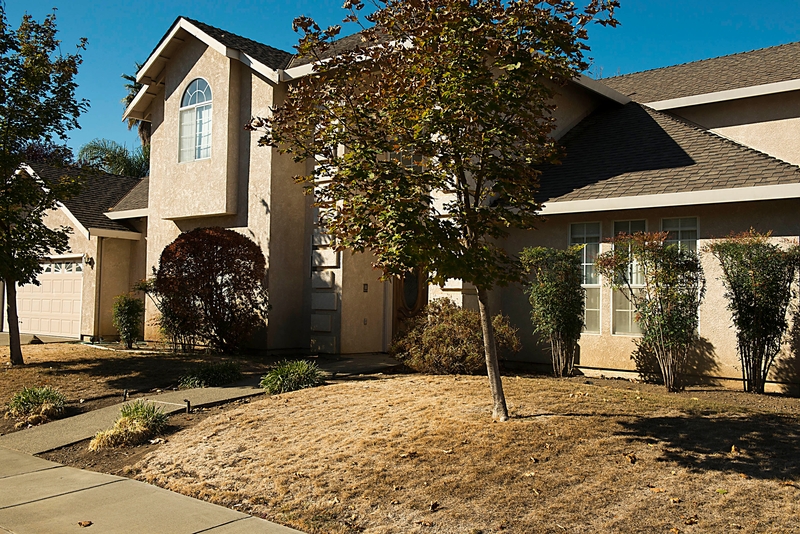 There are many lawns that have a relatively good cover of turfgrass but also areas with no turf or weeds (Figure 2.) We have made the decision that some of these areas can be made into pathways, flower beds, or shrub borders. But we also have decided that we want turfgrass areas for our backyard barbecues, or to have a place at home for children to play. What can we do to renovate these areas? Effective renovation depends upon what plant material is in the site. First, evaluate if the area has been beaten down into a hard “rock like soil.” Make a list of types of weeds, such as annual or perennial species or whether you have some real bad actors that are difficult to control. Will control take some special effort or practice? You may also need to rearrange the irrigation system to obtain uniform watering, with new sprinkler heads to use the least amount of water for the best result. If the soil needs to be rototilled and you don't have perennials weeds, you can rototill the thatch into the soil and use it as mulch. If there is excess plant material, rake it off for use elsewhere as mulch. 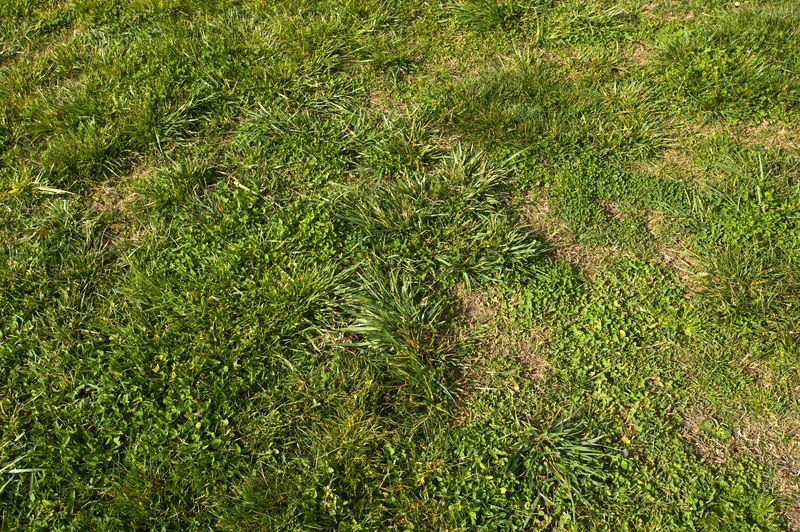 If there are perennial weeds such as bermudagrass, you may need to control in more of the lawn. It depends on what you want the turf to be and whether it needs to be uniform or just a mix of grasses. If the total area needs renovation, see UC ANR Publication 74113 (Weed Management in Lawns) for turf renovation suggestions. If bermudagrass is the culprit another suggestion is to apply a non-selective grass herbicide, glyphosate, to weeds that are growing well. Spray and then wait several days for the herbicide to work, then deep rototill the area to dry out any remaining roots and rhizomes (underground stems.) Withhold all watering so the soil is not re-wet or some bermudagrass often will regrow. Let it dry for several days and rototill it again to bring up new roots and rhizomes to dry again. This should eradicate bermudagrass with a single treatment, if done properly. Prepare the soil raking it flat and removing any clumps of thatch, then reseed or sod the turf to re-establish. This type of renovation should be done in the summer during the dry, hot season. If only small patches are bare, raking the area to remove the old dead plant material will allow you to over seed with new grass seed and then cover with a light layer of fine mulch. Keep the mulch moist to establish the grass. Mow the grass at the maximum suggested height for the turf type, to rapidly establish new turf. 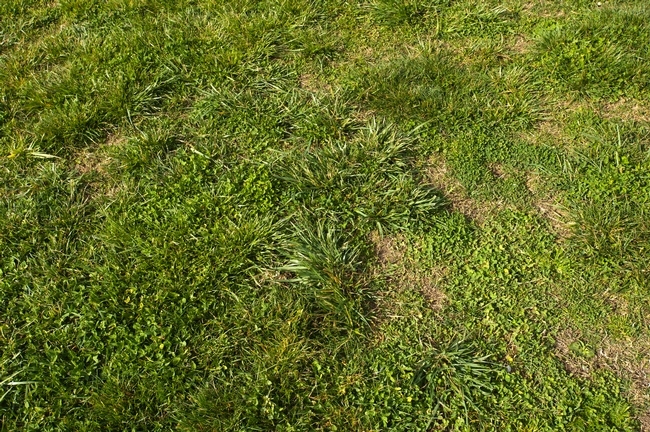 Since bermudagrass will often have seeds in the soil, keep a vigorous cool season turf, such as a turf-type tall fescue, in the area that will compete with the seedling so bermudagrass does not reestablish. Please see UC ANR Publication 74113 (Weed Management in Lawns) for suggestions for maintaining a reduced pest lawn. I like how you said that you could use a rake to remove some of the old plant material in a small area before seeding over it. It would probably be a better idea to use a turf removal service for large areas. That way you could get rid of all of the unwanted material and have a good canvas to place the new grass on.